Designed and produced by Hiltron, the HCS-4 was developed from its HCS3 predecessor which reached four-figure sales following its introduction to the satellite broadcast and communications market in 1997. Maintaining the reliability and functionality of the HCS-3, the HCS-4 forms the central control element for a wide range of satcom applications. These include easy switchover between devices such as downconverters, high power amplifiers, waveguides, MPEG digital video broadcast encoders and integrated receiver/decoders. The HCS-4 can also be used to control and monitor optical-fibre transceivers and antenna heaters. Other features include an N-1 redundancy switch and BUC/HPA controller, LNB supply, 2-1 LNB redundancy switch controller, a fully redundant low-noise 10 MHz reference generator, GPS synchronisation and automatic switchover. The HCS-4 is available as a 2U high 19 inch rack mount unit with main and backup power supplies plus 13 slots for active modules. Also available are two chassis mountable frames accommodating up to 6 or up to 14 active modules respectively. All three versions can be powered from 24 volts DC and are operated via an intuitive HTML-based graphic interface. Modules are hot-pluggable to allow easy exchange. Any new or replaced module is automatically sensed and its address registered. * HCS4-10M 10 MHz reference source. This allows signal distribution to a switchable internal bus and three external outputs individually switchable between off/0/9 dB. It has a very low noise and highly stable internal VCXO plus an internal GPS receiver and can be synchronised with GPS or station clock. * HCS4-DBT Dual Base T for LNBs and BUCs with variable supply voltage for LNB/BUC, individually switchable 10 MHz insertion (0/9 dBm), RF level detection. * L-Band switch units (HCS4-SW), a transfer switch version (HCS4-LST) and a 2:1 redundant-switch version (HCS4-L21). * HCS4-EXT controller module for equipment monitoring and control. * De-icing controller with two main heater circuits up to 20 A each and an independent feed heater circuit (24 or 230 V) plus current, voltage and temperature monitoring. * HCS4-PD2 compact dual channel power detector, up to 18 GHz. * HACUX-ANE wind speed sensor. * HSACUX-DIM2 ultra-compact combination of GPS receiver, flux gate compass and dual-plane high-precision inclinometer (58 x 64 x 36 mm), fully weatherproof. 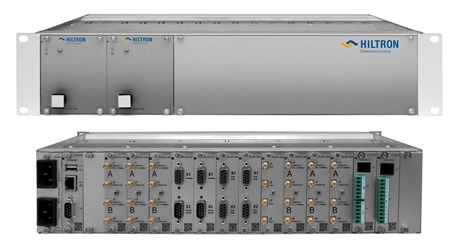 Hiltron GmbH (www.hiltron.de) is a globally active system integrator, manufacturer and distributor in the field of satellite and wireless communication. The company operates from modern purpose-built headquarters at Backnang near Stuttgart. On-site facilities include a large technical operations area with high access doors and ceiling, capable of accommodating satellite link vehicles and their roof-mounted antennas.